Like me, I’m sure you’re familiar with Best Buy stores, but did you know that Best Buy has a direct channel division dedicated to providing end-to-end learning solutions for K-12 Education? They will transform your classroom with the right advice, technology, service and support. How awesome is that? As a mom with a degree in education and a mom who supplements her son’s education, I love that schools are utilizing technology, and that Best Buy is providing technology, to help students succeed. Best Buy makes it easier than ever to give students the tech tools they need to succeed in our ever advancing technological society. Their dedicated Account Managers will consult with you, offer knowledgeable, unbiased advice and guide you to the product and service solutions that best meet your needs and budget. Whether you are rolling out new devices in the classroom, launching a BYOD initiative, or upgrading the technology throughout your school, Best Buy can provide the products, support and protection you need. Teachers and principals, if you plan on attending FETC in Orlando, January 20-23, be sure to stop by the Best Buy Education Booth #131. They’ll be featuring daily demos and guest speakers from Google, MakerBot, EdTeach, Amplified IT and Ergotron, and we’ll be happy to speak with you about your school’s technology needs and answer any questions you may have. A dedicated Education Account Manager will consult with you, provide unbiased advice and guide you to the right solutions for your school. You’ll have one point of contact and get the personal attention you need every step of the way. Partner with Best Buy to outfit your classrooms and offices with the latest education technology like Chromebooks, laptops, tablets, touch screen displays, printers, charging carts, and advanced A/V from top manufacturers you trust. Their team of professionals will assess your technology needs and provide all the services you require, including installation, asset tagging, device management and more. From pre-sales engineering to post-sales support and training, they’ll help you manage your technology and protect your investment with Geek Squad® Support, Geek Squad Protection, training, and professional development. We live in exciting times where our kids can have the best technology in their schools to advance their educational needs thanks to companies like Best Buy. Best Buy education IS your education technology partner. Are you an educator or school administrator? How would like Best Buy to be your education technology partner? Awesome post, thanks for sharing about your experience at Best Buy! My daughter’s school just purchased laptops and tablets for the children to use in school and home. Wow, that is pretty cool. Like having a technology consultant! This would be so very helpful. I would love for our school to partner with Best Buy and bring more technology to the students I think it is a must these days. What a great program, I think it’s great they are so supportive of education. That’s how I feel too. The education system can really benefit from that kind of support! I would have loved if it my school had partnered with Best Buy, think of all the fun gadgets! We homeschooled for six years from when our daughter was in 7th grade until she graduated high school. We used a lot of technology in our home for schooling purposes and I think it’s really important because that’s where the future for these kids is headed. This is so wonderful of Best Buy to do! I know friends who homeschool their kids and this seems to be the right app for them. Thanks for the review. Huh! I wasn’t aware that Best Buy had such an education program but I am glad to learn this. Thanks. It’s really great that they help you decide on the best technology for your needs too. Great program, Best Buy! I didn’t know that Best Buy had such an education program. Good to know. What a great program. I would love for our school to partner with Best Buy. 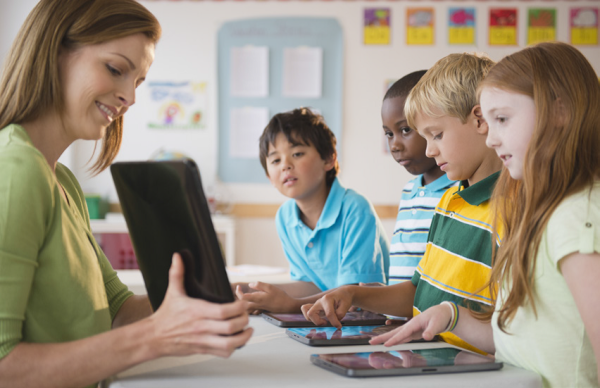 More technology is always a good thing for schools. What a great program. Teacher need all the help they can get and it’s fantastic that such a company is so willing to help support them. My kids use tech in the classroom, but it’s up to the individual teachers to figure out how best to implement it. I am sure any tech assistance they could get would be helpful. This is such an awesome program, another reason I love Best Buy! The school my children attend is a BYOD school for kids in 5th grade and above. I can not imagine life when all three of my kids need to bring smart technology to class every day!